This post is especially for the newly vegan guys who are still wandering through the grocery store looking for vegan deodorant, face wash, etc. If there are any seasoned vegan guys reading, I hope I’m introducing you to some new incredible products. The Vegan Cuts Male Grooming Box products should be in your stable of personal care products at all times. I’ll admit it. The first time I went on Vegan Cuts to send my brother a birthday present, I was a little disappointed that there were only women’s beauty boxes and snack boxes. Although, extremely fun and exciting in their own right, it left me wanting a lot more. So needless to say, when Vegan Cuts reached out to me and asked me to test out the new Men’s Grooming Box, which was co-curated by The Discerning Brute himself, Joshua Katcher, I think I responded to their email before they even had a chance to hit the send button. When they said “Limited Edition” they weren’t lying. This is an EXCLUSIVE box filled with unique, VEGAN, men’s specific grooming products which are NEVER TESTED ON ANIMALS and are damn near impossible to find in stores. I am stressing exclusivity here. It sold out literally in the first week. Oh and again, Joshua Katcher put his name on this. That’s right, THE DISCERNING BRUTE. So for future reference (hint hint…OCTOBER 2014!!!!!!!) when Vegan Cuts calls, you better pick up the next men’s box in OCTOBER 2014!!!!! DO NOT MISS THIS OPPORTUNITY. 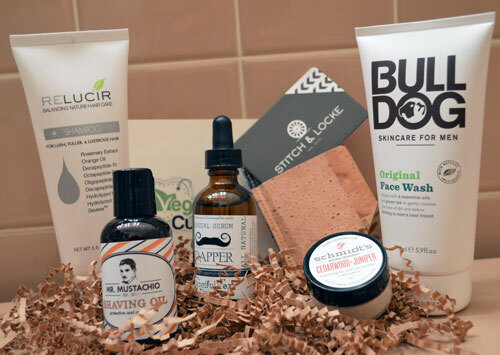 Ok, lets see…WHAT’S IN THE MEN’S VEGAN GROOMING BOX!? Let’s start from the top and work our way down, ok? 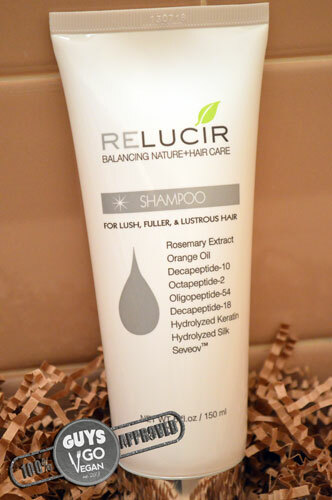 The Relucir Shampoo is actually shampoo suitable for both you and the ladies. I’ve been using the shampoo for a solid week straight now. This is what you’ll notice first. The scent…the most important part of manly personal care products. What popped out to me first was the citrus smell, followed immediately by the rosemary. For me anytime you work rosemary into things other than food, it relaxes me almost as much as lavender. So I give the scent an A+. The long-term effects are a bit more subtle at first, but you’ll definitely recognize a huge difference using this shampoo regularly. Like a lot guys, I suffer from the occasional dry or itchy scalp. For some reason going into this summer, I noticed I had a lot of dry skin. Honestly, it’s disappeared since I’ve been using Relucir. I’ve noticed that my hair has simply felt healthier and its also been reacting with my styling products a lot better. Great choice VC and TDB! This gets the first big ol’ GGV stamp of approval. Next out of the box is a product from a company that I am happy to say I am familiar with already. The big, bad, vegan, no-animal-testing ally from across the pond, The Bulldog. 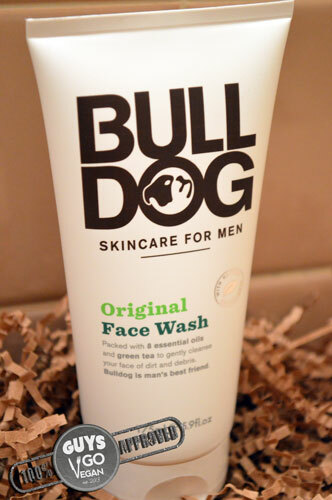 The Bulldog Original Face-wash from Bulldog Skincare for Men is by far my favorite face wash that I’ve ever used. Again, first thing you’ll notice is the scent. You can see their ingredients right on the product page. I’m telling you, if I could bottle this scent and douse myself in it every day, I would. So if anyone from Bulldog is reading this, please take note. I usually wash my face in the shower after my crazy Insanity workouts. What I like about this face wash is the lather. Its not very heavy on my face, if that makes any sense. You barely feel it going on, but trust me you’ll notice the benefits. It also washes away easily leaving my face really refreshed. You might notice a trend in this post. So once again, great pick and The Bulldog gets the GGV official stamp of approval. Next up to bat is a product from a company that I first discovered this past year at the NYC Veg Food Fest. The Fanciful Fox, handmade personal care products for both the guys and the ladies, is actually made not too far from me in Scranton, PA. When I saw they were involved I was really excited. 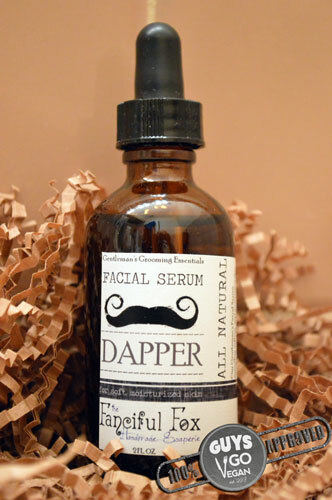 The Dapper Facial Serum is for the true gentleman in us all. Just a few drops on your face and you’ll be smooth and soft for the whole day. Not only that, you’ll smell damn good. There’s something about patchouli that just boosts my confidence in the morning. Try any of their products and you’ll see what I mean. What’s great about this serum is how little you actually need to cover your whole face. Seriously 1 or 2 little drops is all you need. So not only is it a mandatory item for your personal care arsenal, but its very friendly on your wallet. BAM! GGV stamp of approval! Let’s stay on the face for just one more second. For a long time now, I’ve been stressing to my friends the importance of using a shaving oil, either on its own or in conjunction with your favorite vegan shaving cream. Shaving oils just make it that much easier for the blade to move across your skin catching each and every hair on your face. 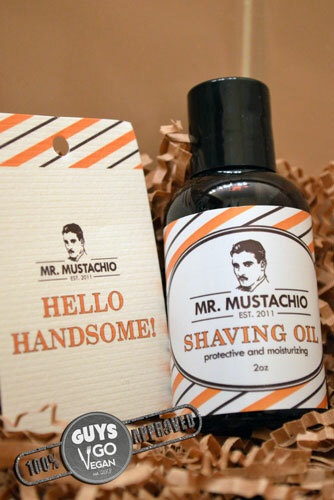 Allow me to turn the spotlight on Mr. Mustachio Shaving Oil which is one of the best shaving oils that I have ever used. Made in small batches by Formulary 55, I cannot recommend using this shaving oil enough. I usually apply the shaving oil first. I rub a generous drop or two vigorously into my skin before I apply my shaving cream. I use both items, because with traditional razors, double edge safety razors and even a cutthroat razor, I find that my skin really likes the oil and the shaving cream combined. So that’s what I do. The direct result is a silky smooth, hairless face and I really think the main reason for that is using the oil as a solid base. Hello, Handsome. MR. MUSTACHIO! Stamp please…bam again! GGV approved! Let’s move off the face to the underarms. Ok, so when I opened the box and saw that there was a deodorant, I was pretty pumped. Before receiving this new product, I had been using another vegan-friendly, natural deodorant. I won’t name names, but I’ll tell you that one was failing the Shaun T “Insanity” test miserably; my wife and cats can attest to that. 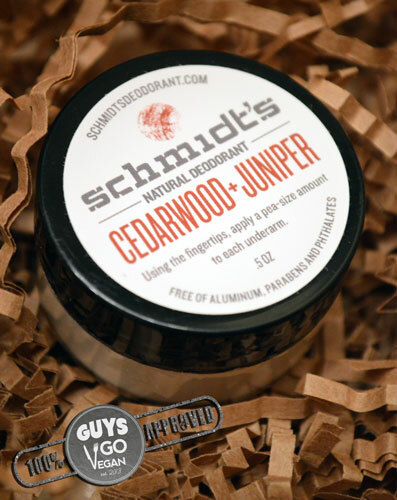 Enter Schmidt’s Cedarwood + Juniper Natural Deodorant. This isn’t your traditional roll on deo. You’ve got to be man and use your hand. That’s right, don’t let this little jar fool you. It’s a powerhouse vegan deodorant. Schmidt’s Natural Deodorant makes vegan friendly deodorants for us guys and the ladies as well. So I guess at this point you’ll want to know how it works. All you need to do is pinch a bit out of the jar and rub it in. Its quite simple. Next question…does it work? Have you done the “Insanity” work out, known someone who survived it or even seen the infomercial on TV? If not, just look it up really quickly. Sweat literally pours off my body during the workout, so I’ll naturally catch a whiff every so often to see if I’m stinking up the room. The first time I used this deodorant, I smelled great. Like I just walked out of the woods. Like a man should smell, right? Haha! Seriously, I’m not joking. After the workout, it smelled as if I just applied it. Ask me again if it works and I’ll stamp your head with the GGV stamp of approval! Buy this right now. Last, but certainly not least, do me a favor. Reach for your wallet. Has it seen better days? If you’re like me, you’ve cycled through a few different innovative options: recycled bike tubes, recycled seat belts, etc. They’re all great options, but there’s a certain George Constanza thickness to them. 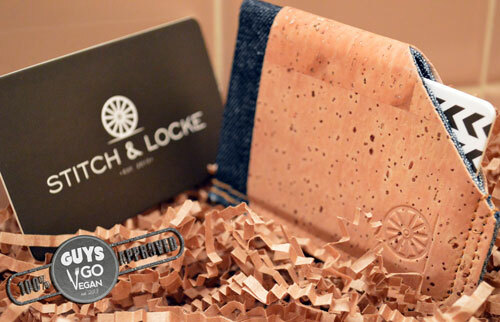 Fresh off a very successful Kickstarter campaign, allow me introduce the SLIDE Wallet by Stitch & Locke. 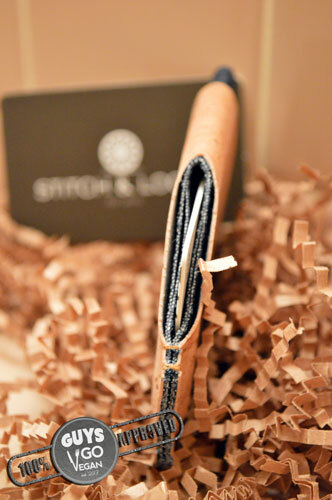 Extremely thin, eco-friendly and animal friendly, the SLIDE wallet offers the best of design and functionality. As I mentioned before, I’ve used some unique wallets in the past, but none have gotten the reaction that this wallet has. 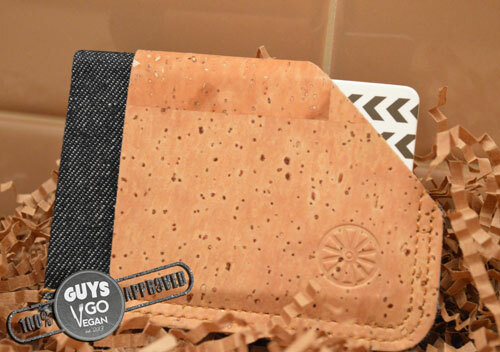 I love the contrast between the cork and the denim. It really pops when you whip this bad boy out at the bar. It is sure to impress just about everyone. The one issue I ran into with the bike tube wallet was heat. Once it got hot out, it never seemed to want to leave my pocket. It just stuck to my leg. The seatbelt wallet definitely served me best and didn’t mind the change in temperatures, but its just a little bit on the bulky side. The SLIDE wallet’s sleek design is perfect for me when I’m wearing a suit. If I’m at a wedding I tend to ditch the wallet all together. Now I actually don’t have to. Its so small, that I can barely feel it on my inside breast pocket. So I’m going to give out one more stamp of approval on the SLIDE Wallet and highly recommend picking one up as soon as possible. Your money will thank you for it. As I conclude this article, I want mention a few things. 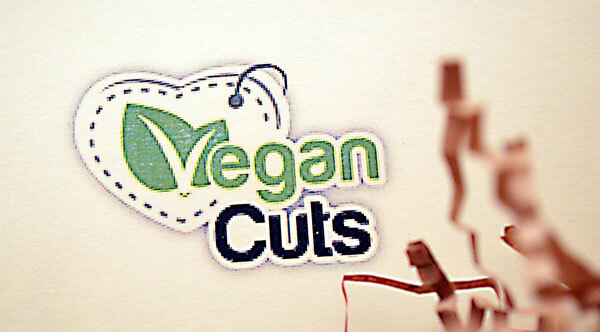 I was asked to test out these products by Vegan Cuts and I was way more than happy to do so. Many thanks go out to the folks over at Vegan Cuts for thinking of me for this trial run. However, I want you to know, honestly that I tested these products out and really pushed them to the limits (i.e. the deodorant). My opinions and reviews are mine and I stand by them. If I seem excited by these products, its because I am. I truly enjoyed these products and I highly recommend them. If you have any questions about these products feel free to shoot me an email or get in touch with the companies directly. Until next time Guys…Go Vegan and don’t look back! The Vegan Cuts Grooming Box: Limited Edition Co-curated by The Discerning Brute, Joshua Katcher.